Bree Fotheringham, 18, is a recent graduate of the Gifted Music School after 5 years as a full-scholarship student in the conservatory division. She currently studies violin with Eugene Watanabe. An accomplished violinist, Bree has placed 6 times in the ASTA String Festival solo competition. In 2013, she soloed with the American Fork Symphony and was a top prize winner in the International Stradivarius Competition—Utah division. She was the senior division winner of the 2014 and 2015 Utah Symphony Youth Guild competitions and 1st place winner of the 2015 Utah ASTA state solo competition. She has had masterclasses and performed with various artists, including Joseph Silverstein, Andres Cardenes, Itamar Zorman, Leon Fleisher, Jason Vieaux and Roberto Diaz. She was a principal violinist in the Gifted Music School Orchestra and has been featured several times on KBYU-FM. Her past teachers were Anna Mitton, Dr. Shi-Hwa Wang, and Karen Child. 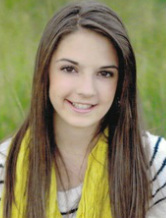 Bree is also a graduate of Layton High school and enjoys academics, arranging music, and traveling. She will be attending the Colburn School to study violin with Robert Lipsett this fall.